I’m looking forward to speaking at the Authority Rainmaker conference this May in Denver, Colorado. As a longtime Copyblogger fan, it’s a great privilege, and I can’t wait to meet many of you. The title of my talk will be: How to Design Interactive Content — Moving Beyond Button Clicks and Form Fills. Which begs the question, what exactly is interactive content? Most content that we’re familiar with — blog posts, ebooks, reports, webinars, infographics, podcasts, etc. — is designed to be passively consumed by our audiences. They read, watch, or listen to it. They may comment on it or share it, which is great, but the underlying content doesn’t ask them for input and doesn’t react to them in real time. In contrast to passive content, interactive content engages an audience as active participants. Interactive content includes quizzes, calculators, configurators, assessment tools, games, contests, workbooks, and more. You can think of interactive content as lightweight “apps” for the web. Like apps on your smartphone, they offer a useful functionality in a small, easy-to-use digital package. But unlike smartphone apps, you don’t need to explicitly install them. They’re just embedded into your website, and they work in any modern web browser. First, as you already know, a primary challenge of content marketing is breaking through the noise. The world is deluged with white papers, webinars, ebooks, and infographics. How many white papers have you downloaded and only briefly skimmed? How many webinars have you signed up for and never attended? Interactive content provides a new arsenal for content marketers to battle the flood of “meh,” passive content. And there’s such a wide variety of interactive content apps to choose from, in so many different formats. You can even invent your own entertaining games or handy utilities, specific to your audience. By its very nature, interactive content engages participants in an activity: answering questions, making choices, exploring scenarios. It’s a great way to capture attention right from the start. Individuals have to think and respond; they can’t just snooze through it. And if your interactive content reciprocates their inputs with useful outputs — as it certainly should — you’ve succeeded in delivering a truly memorable content moment. That’s golden. Second, since the purpose of a lot of content marketing is to educate our audiences, we should take a cue from professional educators. Most people learn best through experiential learning where they try things out and see what happens, test their knowledge and receive immediate feedback, or see how they compare to others. Interactive content can provide this type of education. For example, a stellar ROI calculator lets a participant map out several different scenarios, alter parameters, and see how those factors affect the outcome. It gives them a real feel for the relationship between the parameters and outcomes, far more so than merely reading about them. They can comprehend the concepts faster and easier — and have greater recall for them in the future. Third, and finally, think about the incredibly rich data that can be collected through interactive content. With most passive content, all we learn about prospects is that they were interested in it, possibly the context in which they arrived to get it, and any information that they’re willing to provide us in a gated lead generation form (hint: not much). But with interactive content, we can learn a tremendous amount from their interactions — the rankings people give themselves or their companies when taking an assessment, the questions they missed (or nailed) on a topical quiz, the variations they assembled in a product configurator, or the range of parameters they tried with a calculator. Interactive content reveals incredible insights about individual prospects. We can then use that information to tailor subsequent nurturing and personalization. 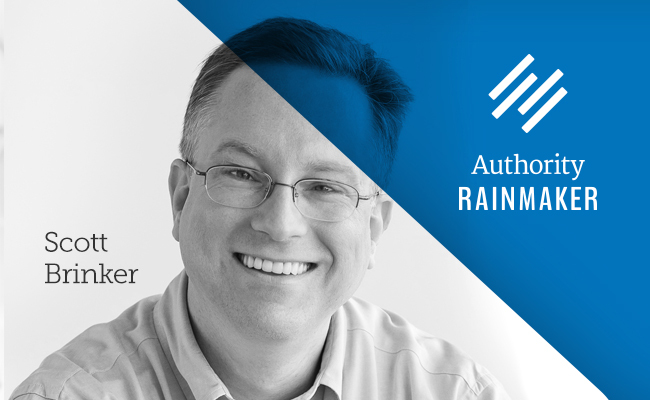 Scott Brinker is among the powerhouse lineup of speakers who will be presenting at Authority Rainmaker May 13–15, 2015 in Denver, Colorado. Accelerate your business with integrated content, search, and social media marketing (plus invaluable networking). Scott Brinker is the CTO of ion interactive, the author of the chiefmartec.com blog, and the program chair of the MarTech conference series. You can reach him on Twitter at @chiefmartec.